Historic Waxahachie Inc. has created an extensive map for the use of both residents and visitors to explore the local history, historical structures and architectural styles that the city offers. The driving tour is marked on signs throughout the city’s historical neighborhoods and business districts. The map is produced and maintained by HWI and is available for free at the Ellis County Museum in the downtown business district. Not only does the map provide a large display of the tour route, but it also contains detailed information concerning the buildings, residences, and landmarks you pass as you drive the tour. 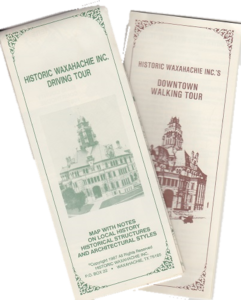 HWI also produces and maintains a Downtown Walking Tour map that highlights the history and architecture of downtown Waxahachie. Waxahachie’s Ellis County Courthouse Square and its immediate vicinity contain one of the finest concentrations of turn-of-the-century commercial architecture in the state. 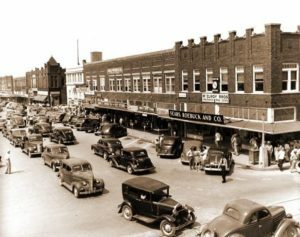 Our downtown is listed in the National Register of Historical Places and is dotted with Texas Historical Medallions and informational markers researched by HWI. Use this tour map to learn more about our unique history. Downtown Walking Tour maps can also be found at the Ellis County Museum. We also now have available and FREE to the public an app that can be used on a mobile device to provide information about the sites you will see in the downtown area. Click on the image below for more information.